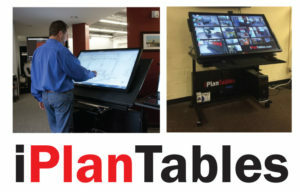 iPlanTables is a professional approach to viewing, collaborating, estimating and archiving critical project information. As a design and construction professional spends up to 90% of their time viewing project data, iPlanTables fills the voids left by traditional monitors, projectors or laptops. Questions? Contact Webb Fox at Webb.Fox@MillerIDS.com or Phone: 512.381.5272.